Typography is the means by which a written idea is given a visual form. The selection of this visual form can dramatically affect the readability of the written idea and a reader’s feelings towards it due to the hundreds, if not thousands of typefaces available. Effective use of typography can produce a neutral effect or rouse the passions, symbolize artistic, political or philosophical movements, or even express the personality of a person or organization. Typefaces vary from clear and distinguishable letterforms that flow easily before the eye and are suitable for extended blocks of text, to more dramatic and eye-catching typefaces that grab attention and are used in newspaper headlines and advertisements. A character is a single letter, number or symbol. The term “Letterform” refers to the designed shape of each character. When text was written using ink and a brush a stroke would often end with a blob or drip of ink as the brush was lifted from the paper. This effect was integrated into writing styles and the Serif was developed as a formal way of ending a stroke. Today a Serif implies craftsmanship. Use a serif typeface when you want to imply traditional conservatism in your message. A typeface is the individualistic designed look of the characters. A typeface designer designs a typeface. The definition of font has changed somewhat since the introduction of digital typography. In the days when fonts were made of metal they were kept in individual cases sorted according to style, weight and size. Today fonts are stored on a computer system as digital data files. Because an individual font can be employed at various sizes we can no longer call each size an individual font. 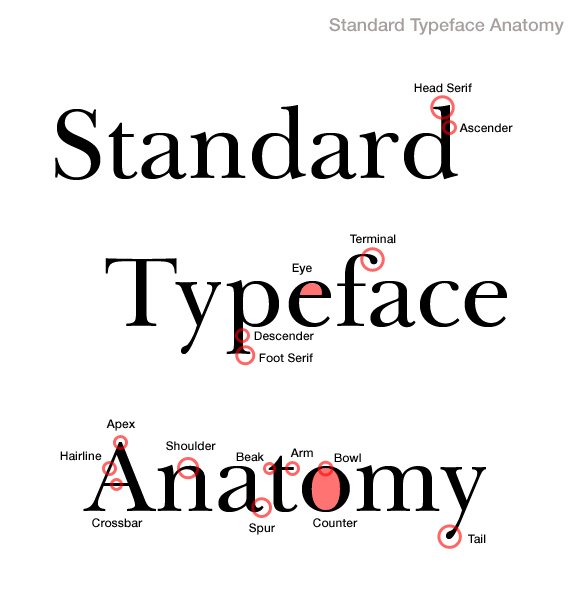 However, we should still refer to the individual styles and weights of a typeface as individual fonts. Together they comprise a Typeface Family. For instance, The Gill Typeface Family has Regular, Italic, Bold, Bold Italic and Extra Bold. A comprehensive vocabulary of terminology describes all the elements of a letterform. The most important element of a letterform is the Stroke. For instance, the capital letter A is comprised of three strokes. Typographers have developed a complex vocabulary to identify the various strokes that comprise a letterform. The weight of a character is determined by the thickness of its strokes in relationship to its overall height. Most typefaces are designed in two weights, regular and bold. The width of a character is determined by the size of the space between its vertical strokes. Terms to describe width include Regular, Narrow, Condensed, Extended. Like notes on a musical stave, the way letterforms “sit” can be analyzed by imposing a so called “staff” of horizontal lines. In order to allow the precise measure of small type sizes the Point system of measurement was introduced by type designers in the 17th century. A single Point is equal to 0.3515 millimeters, There are 72 points in an inch. This matches the 72 dpi resolution of computer displays. 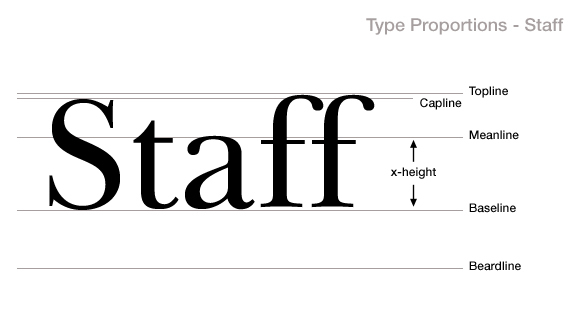 Therefore type at 72 point should measure 1 inch from its lowest descender to its highest ascender. 12 points together are called a Pica. 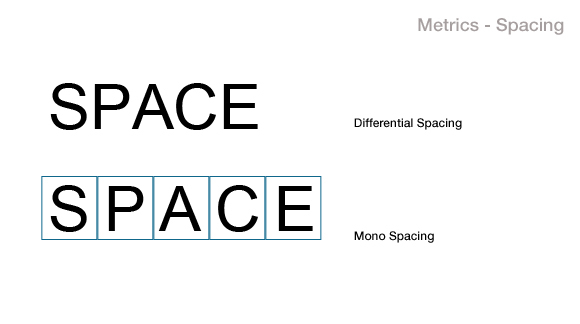 Spacing refers to the horizontal space each character in a typeface requires. Because different characters have different widths Differential Spacing adjusts the gaps between characters accordingly. 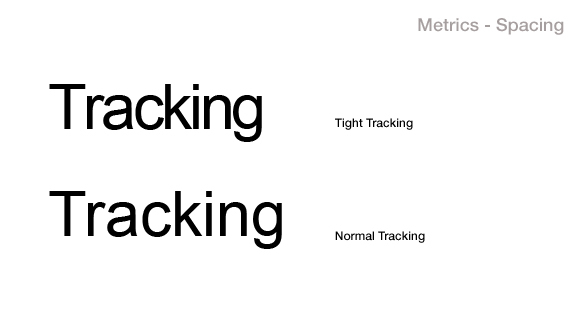 Mono spacing gives each character the same space regardless of width. Tracking refers to uniformly adjusting the spacing between all the characters in a word, sentence or paragraph. Kerning is the process of manually adjusting the individual space between two adjacent characters. 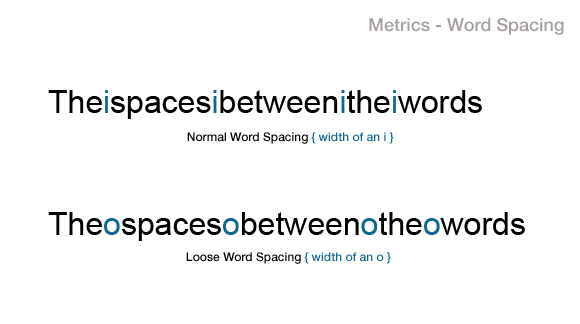 Word spacing refers to the amount of space between words in a sentence. 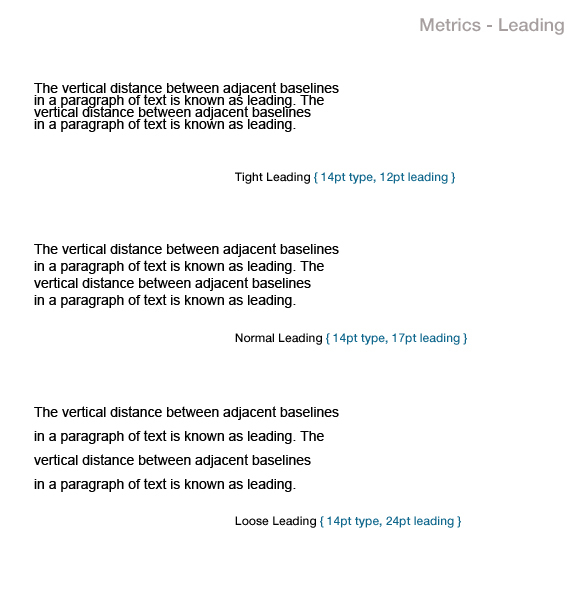 Leading is the vertical distance between adjacent lines of type in a paragraph. The exact leading value is often determined by the line length. Longer lines require greater leading to allow the eye to find the next line as it moves back and down. Leading is usually expressed in Points. A simple rule is to add 3 to the type point size to determine the leading value. A type size of 14pt typically requires a leading value of at least 17pt. You are reading “ Typography ”, an entry published on October 20 , 2009 , under the Design categories and Typography topics. This is great! I’ll read before the start any design project. Thank you. Bookmarked! What a great glossary-like reference! Really good introduction to the discipline/science/art of typography! Very well written and easy to understand! I’ve grasped the basics of typography but there is so much to learn. I still struggle with which font to use for professional type pieces such as in a newsletter. I don’t think the old rule of serif for print and sans serif for web/monitor apply. There are just so many fonts from which to choose. Would you be willing to share some of your tried and true favorites? Thank you very much for posting this information and for your time. Great resource! Thanks so much for this post. Thank you, I grew to understand now. I’m a programmer and not a designer so this is VERY helpful to me as I have been struggling to understand fonts and text representation. It’ so refreshing to revisit the basics. Thanks for the post. Hai… Can you tell me how the effectiveness of typography in conveying emotions to the user? We can say so many things for that. For instance, the combination of colors also plays a big roll in the effectiveness of typography in your design. So, designing the appearance of any typographic layout involves a degree of rhetoric. The effectiveness of typography depends on the use of marks, symbols, or patterns that are familiar and pertinent for a given audience. A functioning message is one that succeeds in connecting with the habits and expectations of its audience. A conscious rhetorical approach to typography would be one which accedes that all design has social, moral, and political dimensions, that there is no sphere of “pure” information, and accepts the challenge to design typography that is functionally and conceptually appropriate for its purpose.